Located in the heart of the Temecula Valley, Callaway Vineyard and Winery is home to an extensive line of wines. 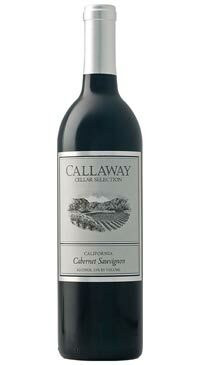 The fruit for Callaway wines is sourced primarily from vineyards in the Temecula Valley sub-region which is located within the California’s South Coast AVA. The Temecula Valley benefits from its proximity to the cooling influence of the Pacific Ocean, which allows a long, even and mild growing season. This is a great value Cabernet Sauvignon from California with ripe field berries; raspberry and blackberry jam, vanilla and spicy notes on the nose. The palate is plush with soft ripe tannins.